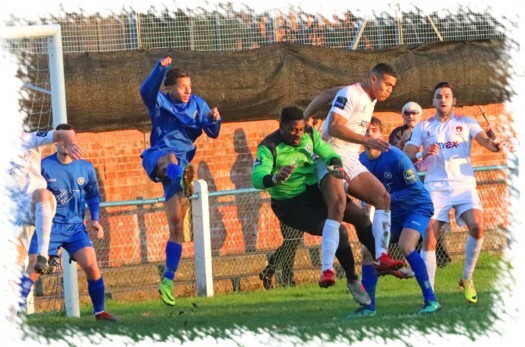 Hayes & Yeading’s eleven match winning streak was brought to an end at Oak Tree Road on Saturday on probably the worst pitch we have played on this campaign thus far as Marlow leapfrogged United to move to the top of the Bostik South Central table. Manager Paul Hughes made a couple of changes to his last starting line-up as Hassan Jalloh came in for injured top scorer Lee Barney and Priestley Farquharson returned in place of Keano Robinson in defence. United knew from the start that their usual free flowing football was going to be a problem with the grass on the pitch so long but this didn’t stop the first chance coming the way of the visitors in just the second minute when Tom Jelley crossed to Jalloh, the United striker turning his marker on the bye-line before trying for goal from an acute angle only to be denied by former United youth team goalkeeper Simon Grant who blocked away his effort. Still within the first ten minutes, two chances for the home side came along in quick succession. Another former United face in the shape of Kameron English collected the ball in midfield and ran at the United defence, his 25 yard drive however was way off target. This effort was quickly followed by the ball being chipped forwards to Junaid Bell inside the United area, he turned past his marker only to be denied by United ‘keeper Jack Smith who reacted quickly to block the effort away and when the ball was fired back across the six yard box English couldn’t stretch far enough to connect and the danger went away. 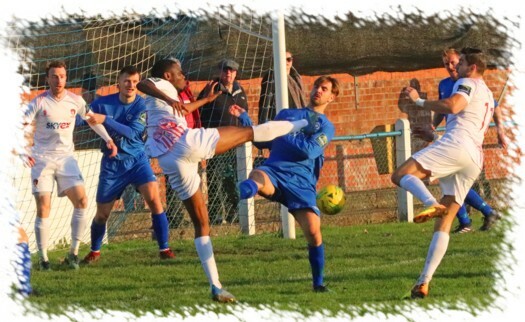 As we arrived at nd passed the midway point in the half both sides went close with United’s Duncan Culley firing across the Marlow goal and agonisingly wide of the far post while at the other end Smith did well to push out a fierce long range Tristan Campbell effort with Ed Asafu-Adjaye clearing up the loose ball. In the 32nd minute the home side should have taken the lead when another former United man in the shape of Isaac Osei-Tutu broke down the left side and crossed to an unmarked English at the far post, the striker smashing his volley over a vacant United net. Five minutes later though the home side did take the lead, albeit in controversial fashion. United’s Liam McDevitt appeared to be fouled by a lunging Marlow tackle that saw the ball run nicely to Marcus Mealing and with no whistle forthcoming the striker picked out Osei-Tutu in the middle and he managed to force the ball past Smith at the second attempt with the goal being awarded despite vociferous protests to referee Elson by the United players. And with little else to write about United went in a goal adrift at the break no doubt to receive some harsh words from Messrs Hughes, Holmes and Preddie as the first half showing was very much below United’s usual standards. A tactical change at the break saw Roddy Collins replaced by Lewis Toomey who moved up to join Culley in attack with Jalloh moving back a little to the front of the United midfield. Indeed United, now playing up the significant slope but with the wind, started well and could have been level just five minutes in when Toomey and Scott Donnelly combined on the right, the latter’s centre finding Toby Little but he could not keep his volley down and Grant was not troubled. Two minutes later English gave United a quick reminder of the home sides attacking intent as he flashed a shot across the box and just wide of the far post and then on 54 minutes United got themselves level when Jalloh collected the ball and chipped a perfect ball over the Marlow defence to Culley who seeing Grant off his line planted a perfect lob over the stranded ‘keeper. 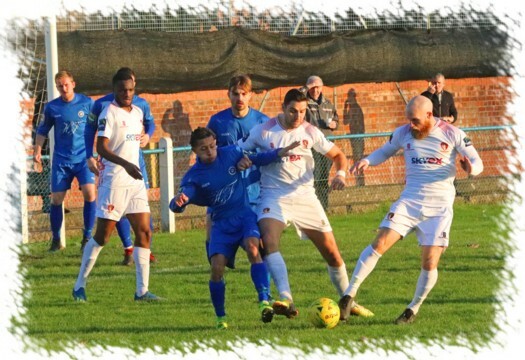 On the hour English again went close as Mealing flicked on a Calum Gallimore long throw, the striker turning to shoot from the edge of the six yard box but again he failed to hit the target as the effort went harmlessly wide. This was followed by a 20 minute United purple patch with nothing to show at the end of it. Tom Jelley raced up the right side and picked out Toomey in the middle, his shot was blocked as far as Culley at the far post but he was denied by Grant who blocked out his effort. Toomey then hit a low drive wide of the target after being set up by Donnelly before the same player collected the ball to the left of the box and tried to match Culley by lifting the ball over Grant only for the stopper to stretch high enough to push the ball away. Culley then headed over on the stretch after Toomey and Little had worked the opening for a cross from the left before United were given a great chance to take the lead when a high ball into the box saw Little flattened by Grant with referee Elson pointing to the spot. Scott Bridges stepped up to take the kick but his scuffed kick was easily saved by Grant who atoned for his error that conceded the kick in the first place. With just two minutes to go United were undone by yet another pair of former United men as Marlow substitutes the Bossman brothers combined with Kelvin firing the ball across to Allen on the right hand corner of the United box, the midfielder picking his spot and curling the ball beyond Smith into the top far corner of the United net. Deep into stoppage time one final chance for United to salvage a point saw a Little free-kick dropped into the six yard box at the far post, Culley was the quickest to react and got a shot on target but sadly straight into Grant’s arms and United suffered a second defeat of the campaign. United Man of the Match: Priestley Farquharson.